We are now in the throws of prepping for the Pacific Puddle Jump. Interlude has new PPG ABC3 bottom paint, Propspeed, zincs and Awlcare on her Dupont Imron clearcoat topsides thanks to the good folks at KKMI in Richmond. Swedish Marine got her Sea Recovery watermaker and Webasto diesel heater (it may be chilly leaving San Francisco) going again. New running rigging by Hansen Rigging was also due after twelve years. Katie is adding a couple more coats of interior varnish and making Costco provisioning runs. Kurt is checking all systems including engines, generators, hydraulics, autopilots, navigation electronics, communications radios and computers. We plan to be underway sometime in April. Ventura to Alameda was 34 hours dock to dock. We sailed a few hours yesterday but motored the rest of the trip to make it in during daylight. Good traveling weather with a light SW breeze. The Alameda draw bridges all opened like clockwork and we even made it thru before commute hours. Miles sailed since we left Alameda eleven years ago: 55,495. We had a very nice time in Marina Del Rey and would like to thank Errol 'Deerfoot II', Jeff and Gayle 'Lazybones' and Fielding and Nancy 'Regatta' for showing us around and making us feel welcome. We had fun cycling on the beach bike path and seeing all the sights from Santa Monica to Manhatten Beach. Restaurants we can recommend: Sidewalk Cafe, Venice; Killer Shrimp, MdR; Tony P's, MdR; Rockin' Fish, Manhatten Beach. Katie's birthday celebration on April 4 was part of a month long festival of reconnecting with old friends in ports all along the coast. Some Cheesecake Factory treats made the special day even more festive. Yesterday we motored 50 miles up to Ventura and are now at Dave and Diane Wyman's house in the Keys with Interlude on their dock (34d15.6'N, 119d15.9'W). The wind will be picking up over the next few days (its blowing 35 out in the Channel Islands now) ruling out any more hops north for a while. We are now in Marina del Rey where Interlude's sistership Deerfoot II is berthed. On the way in Friday we were greeted by 'Beowulf' another Dashew design and had her crew over for drinks. Yesterday we visited some of the Dashew family aboard Deerfoot II and had drinks at the California Yacht Club. Also on the way in, the mega MV 'Air' was in the marina channel with her helicopter taking off. She probably had to move out of her berth to use the chopper. The marina is part of a condo complex with boater dedicated bathrooms, showers, laundry and heated swimming pool. 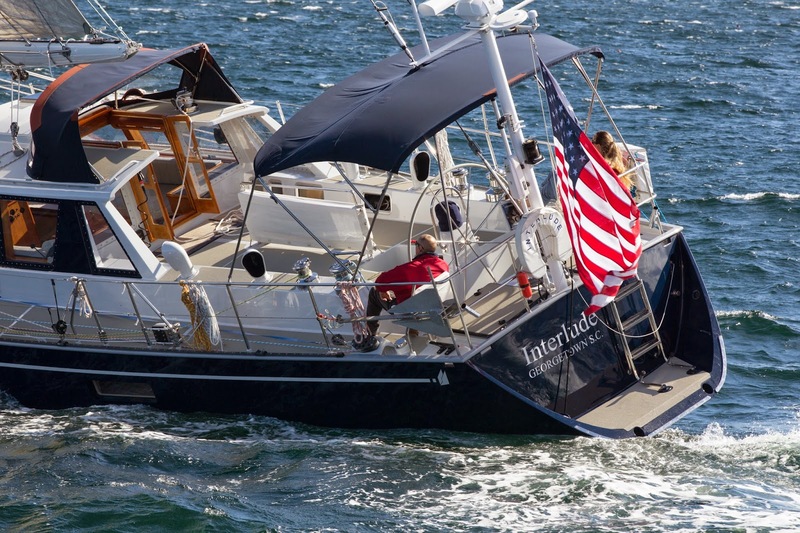 Interlude is in a vacant end tie berth known of by Errol, the helpful captain of DF II (33d58.38'N, 118d27.18'W, Basin 'A' berth 1623/1624 Marina Harbor Anchorage). Today we plan to have Easter Brunch with Jeff & Gayle who we meet cruising in the Pacific, have their yacht in the Med and a home in Beverly Hills. We wish you all a happy fertility celebration and us Christians peace of mind.